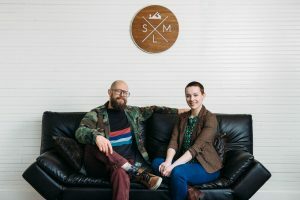 HUSBAND AND WIFE TEAM SHARE THE HARD WORK AND REWARD OF OWNING THEIR BUSINESS IN SODO. 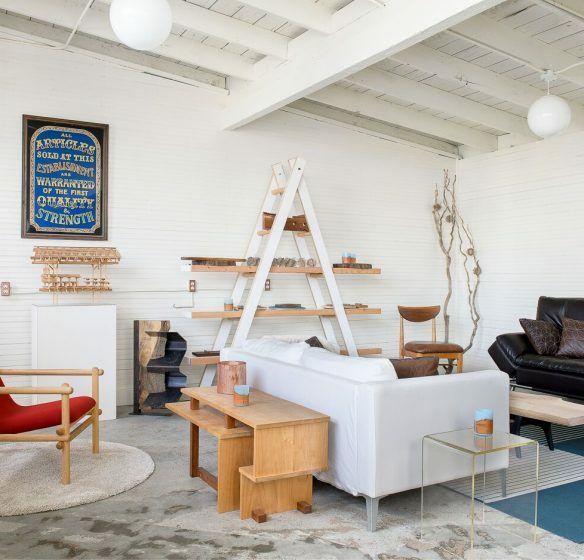 Tucked away in the back of a building on 4th Avenue South, is a small handmade furniture shop called Design by SML, owned by husband and wife, Sawyer and Sara. But the business won’t be tucked away for long; soon they’ll be opening a showroom right on the main drag of 4th Avenue South, with the hope that’ll it show Seattle residents the cool things that are made right here in SODO. Growing up in Florida, Sawyer’s dad taught him how to build with wood, and how to use tools appropriately. Sawyer enjoyed this, but also wanted to put his creative side to use. So, he went to school for graphic design, but later founded his own construction company and became a general contractor. His love for creativity didn’t escape him, so he decided to go back to school (at UW) and get a degree in architecture because he felt that architecture merged both his passions of construction and graphic design. His intention of studying architecture was to help him in his general contracting job. But it wasn’t until his last quarter at UW that he realized he could do something else with his architecture degree. In that last quarter, he took two courses that focused on design and furniture making and they ended up being his favorite courses. 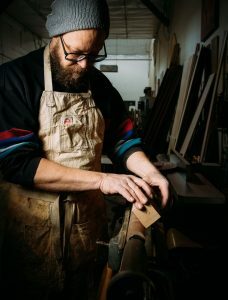 Afterwards, he knew he had a passion for designing and creating furniture, because it allowed him to create intimate, hands-on pieces for people. Thus, Design by SML was born. Sara also always had a knack for design. She grew up in Pullman, Washington and knew that she needed to move to Seattle once she graduated from high school and live in a city that celebrated/encouraged her design passion. So, she went to UW and studied graphic design. After graduation, Sara worked on creating websites, and other design items for a company, but soon realized she didn’t love it. “Sawyer would come home from work and talk about all the cool things he was making and doing and I knew that’s what I wanted to do too,” Sara says. That’s when Design by SML became a husband and wife team. Luckily, their strengths and weaknesses balance each other out, with Sawyer focusing on making woodworking, metal and concrete pieces. Whereas, Sara focuses on more textile pieces, and helped make sure that the business had a cohesive aesthetic. Both find that owning your own business is a lot of hard work- maintaining up-to-date book keeping, timeliness on creating and delivering products and ensuring marketing is relevant. But for them, the reward is worth it. 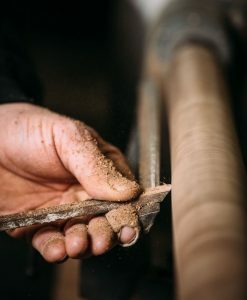 They get the freedom to create, and they also feel more invested because the quality of their products, and their work ethic directly control the outcome of their business. For Sawyer and Sara there isn’t anywhere else they would want to be running this business than in SODO. “Seattle is eccentric, and being in the industrial part [SODO] fits us, and our business,” says Sawyer. Sara echoed that sentiment saying the diversity, inclusion and welcoming nature of Seattle/SODO is what keeps them here. They love the opportunities that SODO has- the opportunities to grow as a community, and to show Seattle residents that it is more than old factories, and sports stadiums. They believe SODO truly is a fun, vibrant place to be, where so many unique businesses are located- from neon sign making and whiskey distilling, to their own business of furniture making. This is why Design by SML is Made in SODO.